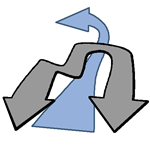 Simple or double arrow in 2D and 3D. Contour by spline or polygon algorithm. Poylgon full 3D, spline shape flat 3D. free gradient fills in 3D too. Fixed issues with ARCHICAD 22. Added button to remove to object origin. Added button for 3D rotation. Transfered 2D to 3D script. Solved by primitive commands to become maximum flexible in attributes and shape. Flat shapes in XY do work. Finished first development and last bug fixing. Added drawing directions (4x). UI finished. Rebuilt 2D script structure. Bug fixing. Added gradient fill along the normal path in the middle of the arrow. Allows a smooth gradient fill with free changing of direction. Rotation im 3D per Hotspot -> Transformation der Koordinaten. Neue Konstruktionsart: 1 Spline mit orthogonalen "Aufspannern". Breite der Aufspanner einstellbar. GS bugfixing für korrekte Darstellungsart.